Global Warming on Mars? | Watts Up With That? Global Warming is a hot topic here on Earth, but it may be the issue will be settled not here on Earth, but on Mars. A study of the ice caps on Mars suggests it is also experiencing a warming trend. A story about new data from NASA cites a six year study by researchers at Duke University showing that Mars may also be seeing a Global Warming trend and that both the Earth and Mars are seeing changes related to solar output. Now where have we heard that before? Oh, seems Al Gore said in his movie An Inconvenient Truth that our own ice caps are melting and that we’ll see a 20 foot rise in sea level as a result. Here’s a transcript of the movie if you are interested. The scientists believe this observed melting on Mars means that there is a layer of dry ice that is evaporating off of a thicker layer of water ice. The yearly increases in evaporation may be caused by a global warming trend happening on Mars. The most recent images in the NASA sponsored study show changes from 1999 to 2005, suggesting the climate on Mars is presently warmer, and perhaps getting warmer still, than it was several years or decades ago. Another recent NASA announcement, that recent water flows have also been discovered on Mars, also lends credence to the idea that Mars is getting warmer. One of the mechanisms suggested is that liquid water is subsurface, and that patches of dry ice acting as “plugs” are melting, releasing the water which moves enough surface material around before it freezes again to show up on photographic comparisons. If both Mars and Earth are experiencing global warming, then maybe there is a larger phenomenon going on in the Solar System that is causing their global climates to change, like changes in the Sun. There’s correlating evidence showing sunspot trends match temperature trends on Earth. Mars may have a similar linkage. 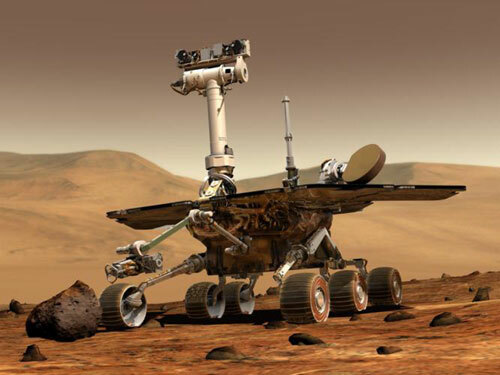 But perhaps there will be those arguing it’s because we’ve landed two tiny SUV’s (Space Utility Vehicles) named Spirit and Opportunity on Mars surface. Sun intensity increasing, combined with Earth Global Warming, magnifies the effects: see previous NewsWhiteHouse.com news and illustrations including mars ice melting (also see Affiliate ANC News Archives / ICCDBB). The emergency need to control the filtering of sunlight at least at the focal area is increasing in rate. The situation is neither Earth alone, nor the Sun as per effect on Mars alone. The increase is from the Earth and from the Sun; for instance if it was just the Sun warming, many of the effects being seen such as the evaporation trend would hardly logically result; or if just the Earth, then Mars and sattelite results would hardly verify.